Critics of Hartford City Hall thought Saundra Kee Borges was gone, but she’s not. She has continued to work as a consultant for the downtown development and minor league baseball stadium project, according to city officials. Kee Borges is being paid for the work on top of collecting her $6,300-per-month pension. For years, she has worn many hats for the city of Hartford. She began working for the city in the Office of Corporation Counsel upon graduating from law school at UConn and she served as deputy corporation counsel, then city manager when Mike Peters was mayor, according to the city. In 2002, she opened her own law firm and returned to work for the city again in 2010. Corporation Counsel Saundra Kee Borges is departing Jan. 30 and deputy attorney Henri Alexandre will replace her in the interim as acting corporation counsel. During the past few years, Kee Borges has not escaped controversy. She was one of the city leaders in attendance on New Year’s Eve 2012 with Mayor Pedro Segarra during the infamous “Caviar Meal” that was partially charged on a city credit card. In 2013, Kee Borges was removed from her position as interim chief operating officer of the city, a month after her city-owned vehicle was involved in an early morning crash following an NAACP dinner. Her fiance, then acting Asst. Fire Chief Terry Waller, was driving at the time, according to police. Kee Borges then became the city’s Corporation Counsel and held that position until January of this year. The day before New Year’s Eve 2014, she suddenly announced she was leaving her $169,000-per-year city job to spend more time with her family. What the city did not share at that time was that Kee Borges remains on its payroll, in addition to receiving a pension. Saundra Kee Borges issued an apology after her city-issued vehicle was involved in a crash. She was not driving at the time. After a call to our tip line, the NBC Connecticut Troubleshooters learned Kee Borges is still working for the city, albeit in a different capacity. Maribel La Luz, spokeswoman for Mayor Segarra, told the Troubleshooters that Kee Borges is acting as a consultant for the $350 million downtown development and minor league baseball stadium project. La Luz explained that when Kee Borges announced her resignation, many of the contracts were still in the negotiation phase, and had not been signed. "We needed to keep Sandy on to complete critical and time-sensitive work on DoNo contracts and negotiations, which were on going during the time of separation," La Luz said in a statement Wednesday. The city wanted Kee Borges to see most, if not all, of those agreements through, and then share with city attorneys her knowledge on the project so there would be a smooth transition for the team assembled to oversee this massive undertaking. "She is scheduled for a payment of just over $17,000 for hours of work between Feb 1 and March 6, 2015," La Luz added. "The projects have been substantially completed and we don’t expect any further services beyond March 31." After making two Freedom of Information requests to the city, the NBC Connecticut Troubleshooters learned the terms of Kee Borges’ current employment, along with her pension payments. An “Engagement Letter” that appears to be written by Kee Borges the day after her departure, says that for her ongoing legal counseling she is to be paid $250 per hour. The document does not say how long Kee Borges will provide this service, or if there is a cap on how much the city will pay. La Luz, however, told the Troubleshooters in the six weeks the agreement has been in effect, Kee Borges has been paid $17,000. That works out to 68 hours total, or roughly 11 hours per week. La Luz also says most, if not all of Kee Borges’ consulting work will be done by the end of this month. It comes on top of Kee Borges' inflation-adjusted pension, which currently stands at $76,000 per year. 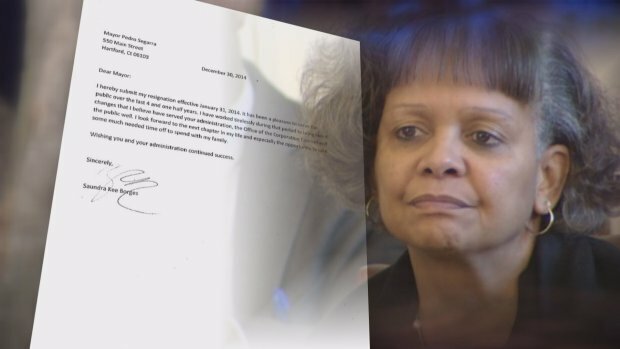 Kee Borges began receiving monthly pension payments after her first retirement from the city in 2003, according to documents from the office of the Hartford treasurer. Kee Borges was making approximately $169,000 in salary when she stepped down as corporation counsel earlier this year, the mayor's office said. If you have any tips about Hartford City Hall or other matters you think the NBC Connecticut Troubleshooters should investigate, email Len Besthoff or call the Troubleshooters hotline at 800-523-9848.